Having dined well on the twin intoxicants of strong critical buzz and moderate box-office success, mumbling oracle Sylvester Stallone has emerged this week to prognosticate on the future of the Rambo and Rocky franchises, and specifically its surprise-success spinoff series Creed. Talking to Variety, the punch-drunk sibyl echoed comments from co-star Michael B. Jordan and MGM studio head Gary Barber, who’ve both expressed interest in a sequel to Ryan Coogler’s 2015 boxing success. 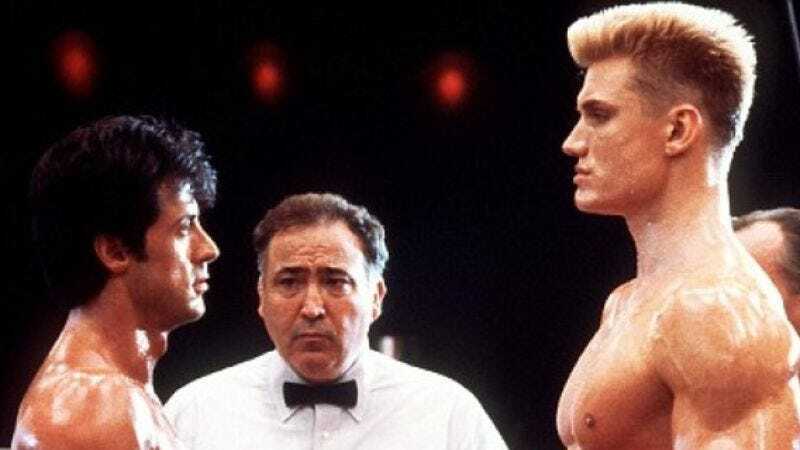 But Stallone, unwilling to simply say, “Sure, that sounds fun” and move on with his day, went into a lot more hypothetical detail than Barber’s simple, “There’s no doubt that we’re making a Creed 2.” Instead, the veteran actor, Oscar-winning screenwriter, and giant, oft-punched bag of meat threw out a bunch of hypothetical angles that the film could take, including a flashback-and-Carl-Weathers-heavy retrospective on the series, à la The Godfather Part II, or Stallone’s usual narrative fallback: getting into an epic, patriotism-tinged punch fight with a massive, intimidating Russian guy.